In his recent post at this site, Warren Emerson asked us to consider the role of memoirs in “law and literature.” He points out that autobiographies “in a powerful way force us to ask a central question of literary criticism” and legal analysis: “Do you believe the author?” And, if you don’t believe the court’s or memoirist’s justification, then is the untruth deliberate? Moreover, how can you make these determinations about places and time periods beyond your comfort zone? 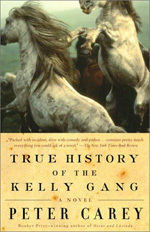 In exploring these issues, I recommend the fictitious memoir, True History of the Kelly Gang, by Peter Carey. This exciting and superbly written novel about Australia’s most famous outlaws raises many significant legal questions. Just as importantly, it urges its readers to ponder what modes of writing can best contribute to a “true history” — an autobiography, court documents, newspaper accounts, or a novel? Ned continually portrays the politicians, courts, police, and rich landowners (“squatters”) arrayed in a conspiracy against the interests of the poor and the children of convicts: “They could bankrupt or hang you as they pleased.” It’s true that Victoria’s constitution bequeathed a great deal of power to the squatters, and that corruption and prejudice infected the local police and magistrates. Real-life Ned and his relatives certainly faced persecution even before his gang killed policemen (at Stringybark Creek) and stirred up enormous hatred. But, “several instances over the years… indicate there was a civilized aspect to the Kellys’ relationship with the police that has been frequently overlooked” (Castles 119). Five years before this quotation was published in the Castles book, Carey’s novel admirably elucidated (in a way that non-fiction cannot) how complicated these relations (involving Ned’s mother and siblings) might have been. Carey accurately depicts Ned destroying some mortgage deeds at a bank he robs, to obliterate the debts of the poor. The narrative fails to mention that, here, Ned was imitating the real-life exploits of the most famous bushranger to precede him, a man named Ben Hall, who burned storekeepers’ ledgers with a similar motive. In the novel, Ned starkly admits the “cupboard love” of the poor: they continue to support him only so long as he brings them a net gain of material comfort. Nevertheless, he’s also quick to credit the rumor that poor farmers would rise up and revolt at his command. Was he perhaps duped by the very journalists he despised? Many newspapers vastly over-reported the number of his supposed “sympathizers,” in order to whip up support for a draconian law leveled against anyone appearing to assist the Gang (Castles 115-16). I give fair warning to all those who has reason to fear me to sell out and give £10 out of every hundred towards the widow and orphan fund and do not attempt to reside in Victoria but as short a time as possible after reading this notice, neglect this and abide by the consequences, which shall be worse than the rust in the wheat in Victoria or the druth of a dry season to the grasshoppers in New South Wales[.] I do not wish to give the order full force without giving timely warning. but I am a widows son outlawed and my orders must be obeyed. Carey beautifully stages how Ned might have felt living like a hunted “wild animal,” literally outside of the law: He becomes enraged, forlorn, then increasingly megalomaniacal, and he more confidently assumes the mantle of a revolutionary and a potential martyr. But, as I alluded to above, he also intensifies his effort to manipulate and create the law. Again and again, the fictional Ned (even more than the real one) enacts his new mantra: “We would write our own damned history from here on.” For one thing, Carey extracts from the above-quoted Jerilderie passage but substitutes even more dramatic language. Furthermore, Carey’s hero defends himself in front of the countrymen he is holding captive at Faithfull’s Creek, in a mock trial of sorts (“before a jury of our peers”). He concludes that they acquit him of multiple counts of murder on grounds of self-defense, with some jury nullification thrown in. Historically, the Victorian prosecutors had to carefully scrutinize the evidence to find hangable offenses with which to try Ned to a unanimous verdict. In the novel, however, the bandit seems mistaken about the scope of available defenses. True, the Ned character knows a fair amount of law: He plausibly threatens to sue for slander; he quotes his lawyer (e.g., “time is of the essence”); he recognizes exactly when he becomes a participant in highway robbery in the eyes of the law. Yet he seems to believe that he could be exonerated for three different shootings (Bill Frost, Fitzpatrick, Strahan) in defense of third parties. He’s apparently oblivious to the felony murder rule, in force at that time and place. Is he oblivious? Or is he “writ[ing] his own damned history” for an alternative court? Is he deluding himself, or us? Very interesting. Robert Cover’s analysis of “nomos” seems relevant here: the creation of an alternate legal universe. The lure of the outlaw is still very much with us, witness the “barefoot bandit” stories this week (Colton Harris-Moore).